Went for a colour followed by cut and blow dry. Colour was ok. I gave the stylist a picture of how I wanted my hair cut and how I wanted my fringe done. Instead of feathered and layered hair, I ended up with blocks of hair which had no style. On top of that, my fringe looked like the curtains that teenage boys had in the 90s. The dye stain hadn’t been taken off either. I was given baby wipes to just scrub at my own forehead, again which did not help. She didn’t help me when I told her it was not coming off. After the cut, she didn’t try to fix the problem when I told her that the cut was nothing like the photos. Ended up making an emergency last minute appointment at another salon on the same day. Definitely would not go ahead. Always enjoy my regular visit. Everyone there is friendly and Chloe is absolutely the best hairdresser in Brum! Outstanding service, really relaxing time. More than a hair cut, a lovely experience. Had my hair cut and coloured by Alex today. As always was given good advice based on my hair and left feeling great! Great staff, great atmosphere, great service. Perfect every visit ? Becky as always has done a brilliant job! Wouldn't go anywhere else to have my hair done, she also gives he best head massages which is an added bonus! Love my hair! Thank you! 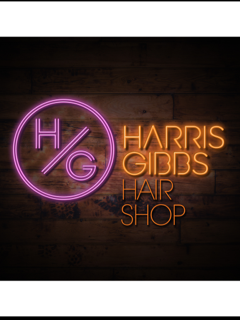 Thanks for choosing to visit Harris Gibbs Hair Shop, we look forward to welcoming you again soon. Chloe @Harris & Gibbs knocked it out of the park once again!!!! Thanks ? Always confident of a fabulous job!!!! We look forward to welcoming you again soon to hopefully recreate such a positive experience for you. Harris and Gibbs are amazing. I really feel like I'm being spoiled every time I get my hair cut, from the massage chairs they have for hair washing to the kindness and genuine nature of the staff. They give really lovely haircuts - despite having moved away I keep coming back here. All the staff are great but Alex does my hair and I love it each time. Thank you for taking the time to write a review and for being so complimentary. Even more so, thank you for still choosing to visit us even though you have to travel further. Its great to hear that our whole team made your experience such a good one, and we aim to create this every time you visit. The salon was buzzing with conversation and busy hairdressers this morning. Staff always giving a personal service. Thanks for reviewing us. great to hear that the atmosphere you experienced when you visited was was so positive, we value you and every other one of our clients for being part of the salon and allowing us to create such a great salon environment. Thanks for the 5* review, fantastic to hear that our salon, boys and girls are so great and our service is super. Thank you taking the time to write a review about your visit to us, and thank you for your kind words. We are delighted to hear that your experience was so lovely and you left feeling a million dollars. We ensure all our team see the reviews our clients write and we can assure you we will strive to ensure we maintain the service level you have come to expect. Thanks for your positive review and for choosing to visit us at Harris Gibbs Hair shop, we look forward to seeing you again soon as much as you look forward to your appointment. Hello, Thank you for taking the time to review us and thank you for choosing to visit us. That said, we appreciate you making us aware and hope that next time we see you you experience an even higher level. Today I visited Harris & Gibbs to refresh my colour with a half a head of highlights...as always I left one very happy customer! We are over the moon to read that we have managed to provide such a positive experience for you. We genuinely value you support every time you visit us and we are already looking forward to seeing you again soon. Today was my first visit to Harris & Gibbs. I can honestly say from the moment I walked into the shop everyone there made me feel really welcome and relaxed. Chris who I've known for a long time was brillant and is so talented. I now have a brand new style which I love. Will recommend to all my friends and family. Thank you for taking the time to review us and thank you for choosing to visit us for the first time. we are delighted to hear you are so happy with your experience with us, we strive to create an atmosphere that you have described and value our customers feedback highly. We look forward to welcoming you again next time and thank you in advance for any recommendations you make to us. Great service and results I am always happy with. Thank you for your 5* review. its fantastic for us to read that you are always happy with the service and results you received when you visit us. Appointment with Alex and great service as always and brilliant cut. Came out feeling really good about myself- what more can you ask for! Thanks for taking the time to review us, and thanks for your kind words. We are pleased to hear that our service was the standard you have come to expect and more importantly we are delighted to hear you left us feeling great. We look forward to seeing you again next time you visit us. I’ve tried a few salons in the JQ and this is by far the best. Becky was so friendly and really listened to what I wanted done with my hair. Great salon with great staff! Will definitely be back! Thank you! Thanks for reviewing us and for giving us such positive feedback. We are delighted to hear that you are so pleased with the service you received. We try really hard as a team to ensure all our clients receive a personal service and a the result they want , great to hear we achieved this. We will ensure the team see your review. We look forward to welcoming you back next time you visit. So glad I found this salon! Chloe is a mind reader and love the massage chairs! We are glad you found us too, we are not sure how Chloe learnt to read minds but delighted she can. We look forward to welcoming you to the salon again soon. Love coming to H&G, Chloe does an amazing job on my hair, makes me feel welcome and I’m always very happy with the service I receive! Thanks for the kind words, great to hear that Chloe looks after you so well and more importantly that you love coming to visit the salon.